Jewelry can take a drab outfit and make it stylish. That's why it's one of my favorite things to shop for! I especially love to wear bold and dramatic pieces like this one from Le Mode Accessories. Wear it with a feminine party dress to give it some edge or with a sequin tank and fitted blazer for a work party. This contest will end next Tuesday night at midnight Pacific Time. Cute and versatile. Following you both on FB. Love the chain links of this necklace. Thanks so much for the give-a-way! I already like you on fb and now I like Le Mode too! Love the dramatic links bracelet! 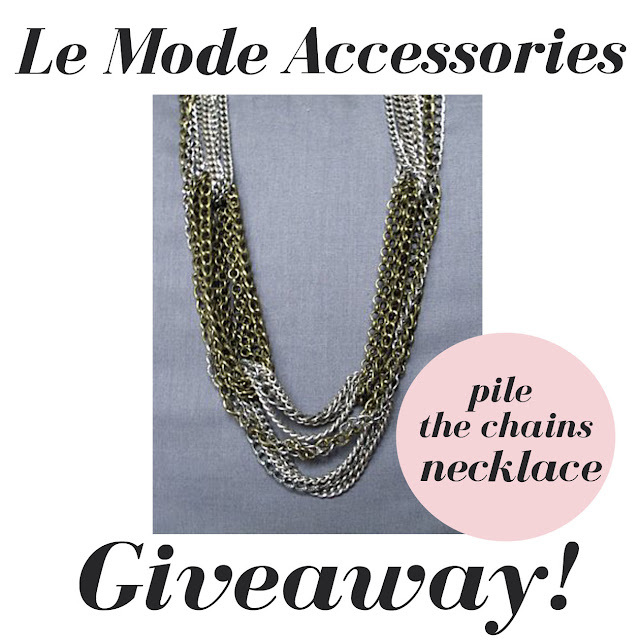 I "like" Sterling Style and Le Mode Accessories on FB! Exactly the kind of jewelry boutique I've been looking for! Bold & unique pieces at an affordable price. Love it! I'm a fan of you both on FB! Thanks for sharing. Love the necklace! Liked you both on FB. Gorgeous! Ive liked you both. Love the mix of gold and silver! Liked both! super cute! i can think of tons of outfits i could wear this with! already following you both on facebook :) I love this necklace! can never go wrong with more jewelry. I love what i have seen of Le Mode! Taylor, you always have the best giveaways! :) Already had you 'liked' on fb, so half the work was done already. 'Liked' Le Mode as well! This is absolutely beautiful! A wonderful way to accent an outfit, especially for a minimalist like myself! I am following both FBs as M. Huynh! Oooooohhh, I hope I win:) Thanks for the giveaway! Like you both! Looooove the necklace, pick me, pick me!! I love the mix of chains! Liked Le Mode on FB. Love that chain on chains necklace!!! O-M-G...this necklace is "sublime paradise"...i need this in my life. Would LOVE to win this! This necklace is so very lovely! Man that could be worn with anything! Thanks for such a great giveaway. Liked you both on FB! =) I am in desperate need of a bold statement necklace like this. Pretty much everything I have is dainty so I would LOVE to add this to my jewelry drawer!!! I used to have a cheaper version of the chains necklace and lost it :( I'm in definite need of a statement piece like this to dress up my work attire. Liked both pages on FB. Thanks doll! Love this necklace! And like you both on Facebook. Awesome.